Exciting downtown location in world famous Kensington Market. This historic home boasts high ceilings and an unexpected walled garden, providing a wonderful oasis from the bustling streets of the Market. The house retains its original detailing and proportions juxtaposed with (award-winning) architect-designed contemporary washroom and modern furnishings throughout. Skylights on the second level fill the inner spaces of the house with natural light. This house is charming to live in and is in the centre of the cultural core of the city. Architect-designed custom modern washroom. Operable windows & skylights wash room with abundant natural light. Oak veneer panels line the walls & cabinets. Natural stone tiles across the floor. Soaker tub & shower. Spacious eat-in kitchen, opens to back garden. Bright and sunny. This house had every amenity - wifi, laundry, a nice kitchen, even a parking spot. Perfect for our family of 4. The photos perfectly capture the house - everything is as described. And the location could not be better - just around the corner - literally 20 feet away - is Kensington Market. Yet despite the closeness to the market, the house is quiet and peaceful. I ended up spending most of my time - when I was at the house - in the enclosed garden. It was very private and peaceful, with lots of shade, birds, squirrels, and a cute fish pond. We were met by Jack the caretaker (who lives right across the street) - he had lots of great advice about the area and was very helpful and friendly. Basically - for a family of 4 you won't find a more beautiful place in Toronto. But the biggest amenity of all is that Kensington Market is right there. Everything you could possibly want is in there. It's like the kind of old-time neighborhood filled with small specialty shops - cheese shops, fish stores, Mexican Tiendas, restaurants, bakeries, coffee shops, souvenirs, vintage clothing, I could go on forever. My daughter is a vegan, and there were at least a dozen places catering to her needs. I think it embodies the spirit of Toronto - a huge mix of ethnicities that are sharing the best of their cultures to make a wonderful, livable city. Thank you, Josh, for your wonderful review. I'm very happy that you had such a good time in Toronto, enjoyed the house and the Market. It's a special neighborhood in a city made up of villages, as you say embodying the rich cultural diversity of Toronto. I was glad to see the roses all in bloom when I got home, sorry I missed the peonies. Wonderful home in a fantastic location! Clean and spacious in the heart of Kensington market with parking and a lovely backyard! Owner and property manager easily accessible and very helpful. Wonderful rental. Thank you. We had the great pleasure of staying at Milly's utterly charming, wonderfully located jewel if a home. Kensington Market exemplifies all that is best about Canada. Tolerant, vibrant, multilayered, multicultural, endless interesting and frankly delicious. Intelligent, thoughtful, not pretentious. Molly's house is 2min from the tram lines, museums, restaurants , parks, music. My kids 12 and 8 fell in love with it and the neighborhood. The caretakers, Jack and David were discreet, kind and always helpful. The shower is a bit challenging to manoeuvre but otherwise, we'd recommend unreservedly. Amazing location, lovely property, lovely owner, a most pleasant experience! First of all, you could not ask for a more gracious and lovely property owner than Molly. She responded patiently and timely to all of our emails and made sure we felt accommodated as appropriate. Plus, it's obvious Molly takes great pride in the property as things were all well taken care of; the only issues we had were minor and totally solvable. It was nice to stay in a place where the owner treats their property in a manner we treat our own property; with loving care. The kitchen is definitely a working kitchen with a great modern stove, nice high ceilings and lots of counter space along with all the kitchen utensils and pots and pans you would need to cook any kind of meal. Out the back door of the kitchen is a great deck area where the barbecue is easily accessed, of which we took advantage as the nearby butchers and fish mongers were also right there in the neighborhood and there is nothing like coming back from a trip to the meat market and slapping a big beautiful steak or a fresh whole snapper on the grill. The place is big in comparison to a lot of other urban places we've rented, lots of room to roam around. Great living room sofa to take naps on and read, a great deck and garden area to sit or lay in the sun and to also take naps in and read. Enormous stone dining room table to eat at if you want to feel fancy, otherwise a cozy kitchen table to also use. Comfortable bed in master bed room with lots of closet space, and a nice guest room (although we didn't try the bed so can't comment but looked cozy too) also available. But for us the biggest win was the location ... step out the door, take a right for a few steps, take another right and what begins is the Kensington market area. And that was a great experience besides being a perfect "stepping off" location close to little Italy, the Annex, Chinatown, King West, Queen West, the Entertainment District, Blue Jays Stadium and etc. We walked 75% of the time, and when we didn't we were a couple blocks away from the trolleys and buses. Very safe, very easy to get around. We also appreciated the off-street parking Molly provided us and it was also very assuring to know Molly had a great property manager nearby who could be available to us if we needed anything. This was one of the best stays we've had, and we travel extensively and use a number of housing sites so we've had numerous experiences. Thank you Molly! We arrived at the house and were immediately pleased with it. We were met by a neighbour from across the street, who showed us around the house explaining what needed explaining, who was very comprehensive and kind. The house is wonderfully eclectic in its furnishings and there was plenty of living space for the four of us downstairs. The kitchen was well equipped and we enjoyed making breakfast most mornings, with the weather allowing us to eat it in a very pleasant garden. The outstanding thing about our stay was the location, if your looking for many bars, restaurants and independent shops and markets, this is the place for you. We could easily walk downtown, but mostly enjoyed the neighbourhoods close by, such as little Italy, Chinatown, Kensington and Queens Street. The only thing to consider, would be that the third bedroom bed, may be fine for a child, or a small adult, it may be uncomfortable for a larger adult. We had a slight issue with parking, however, I think it was a one off issue and the neighbour dealt with it impressively. I would definitely recommend this house to friends and relatives and if I was in Toronto again, I hope it would be available. Located within the exciting, world-famous & historic Kensington Market where the foods of the world are available. 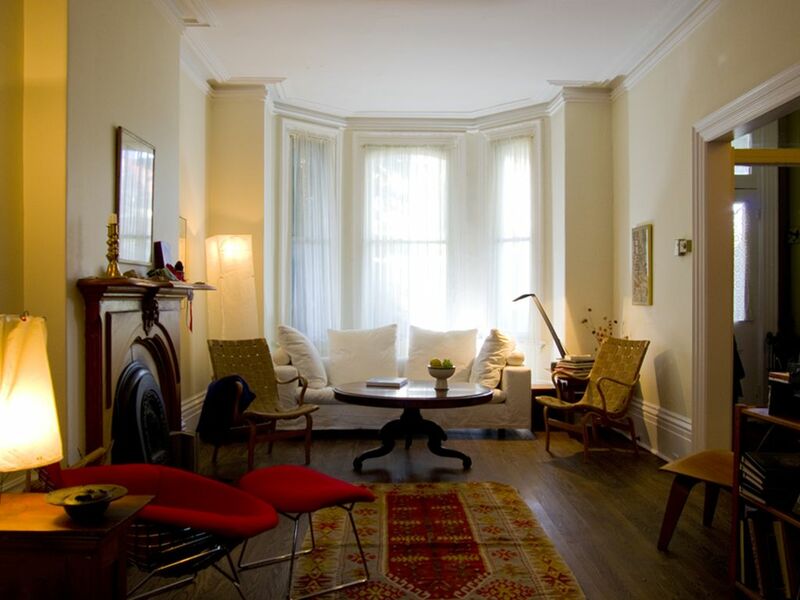 3 blocks to Chinatown, 5 minute walk to Art Gallery of Ontario, 2 blocks to University of Toronto campus. Within 2 blocks to 4 major transit lines. Little Italy 3 blocks away, Little Portugal 3 blocks away. 10 mins walk to Queen Street West shopping and fashion district. The property is available only from 11 June to 5 September 2016.